BETHLEHEM (Ma’an) — The cultural arm of the United Nations has cancelled the opening of a controversial Israel-themed exhibition at its Paris headquarters after coming under pressure from a number of Arab states, according to Israeli media. Israeli daily Haaretz reported that a UNESCO exhibition focusing on the “3,500 years of ties between the Jewish people and the Land of Israel” was cancelled by the cultural body after a letter of condemnation was sent by representatives of a number of Arab states. On January 14, the president of the opposing group Abdullah Elmealmi sent a letter to Bokova saying they were “deeply disturbed by the exhibition” and “condemned” it. “The media campaign accompanying the exhibition will inevitably damage the peace talks, the incessant efforts of U.S. Secretary of State John Kerry and UNESCO’s neutrality,” he added in the letter. UNESCO admitted Palestine as a member in 2011, after which Israel and the United States pulled their support for the cultural body and stopped paying their dues in protest. The Simon Wiesenthal Center, one of the exhibition’s main sponsors, is currently trying to build a “Museum of Tolerance” by bulldozing an ancient Muslim cemetery in West Jerusalem that was in active use for 1,000 years until the 1920s. Israeli authorities frequently use narratives of a millenia-long uninterrupted Jewish presence or connection to Palestine in order to undermine present-day Palestinian connections and legal rights to their land. The topic is particularly sensitive given that members of the Israeli settlement movement often point to the previous existence of ancient Jewish towns on the site of currently existing Palestinian villages in order to dispossess them of their lands and build illegal Israeli settlements atop them. 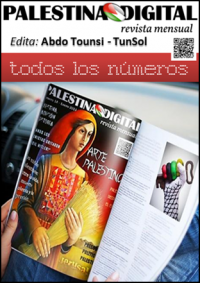 vía Report: UNESCO cancels Israel exhibit following Arab pressure | Maan News Agency. 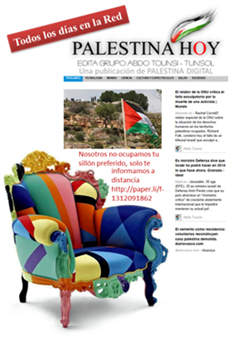 Esta entrada se publicó el 19/01/2014, 18:32 y se archivó como History, Palestine. Puedes seguir cualquier respuesta a esta entrada a través de RSS 2.0. Puedes saltar hasta el final para dejar una respuesta. Servicio de ping está actualmente deshabilidado.